Of all the Gothic buildings I’ve explored, these are the most significant in artistic history. 1. The abbey church of Saint Denis, Paris. The mother of them all. King Louis the Fat’s right hand man, Abbot Suger, implemented the first full examples of Gothic style in the entrance and choir of the old basilica, including a glorious collection of stained-glass windows. Suger wanted the altar to be bathed in light. Mission accomplished. Suger did this work around 1140, when Angkor Wat was being built in Cambodia. But no other culture made anything like Gothic cathedrals. Only the West was able to build large inner spaces in stone and line the walls with stained-glass windows that filled them with light. Please come in and explore one of the greatest art forms in world history. 2. Laon, France. 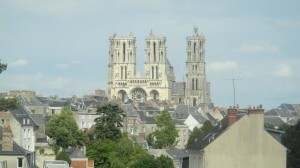 In the second half of the twelfth century, Gothic style spread to several cathedrals a little north of Paris. These are very interesting because there wasn’t yet a main style–the architects were experimenting. 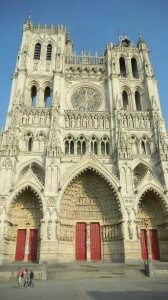 Laon mixes older Romanesque and Gothic features. Outside, the town is beautiful–it’s on top of a 250 foot hill. 3. Chartres, France. The first fully classic style cathedral–all parts fit each other in a logical system. It reflects the universe that folks in the thirteenth century believed God created. Everything is in its place. 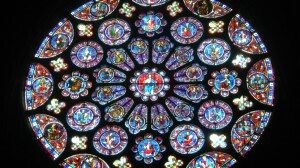 Chartres has the most complete collection of original stained-glass windows and sculptures–a must see! This cathedral became the standard–it influenced more Gothic buildings than any other cathedral did by far. 4. Amiens, France. Classic style at its finest. Sit in front of the west facade in the afternoon and bask in glory. Its sculptures are more lifelike than Chartres’. They’re more three-dimensional and classically proportioned. 5. Rheims, France. Another great example of classic style. But it was built a little later, and it begins to take steps into more flamboyant styles that Gothic architecture evolved into. Its sculpture is stunning. Amiens’ statues can seem abstract–classical order. Rheims’ look like real people. 6. 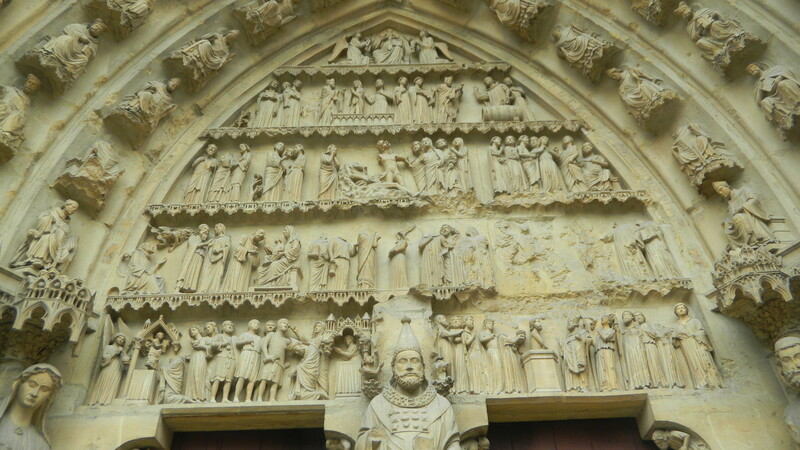 Bourges, France. This is a different type of classic style. 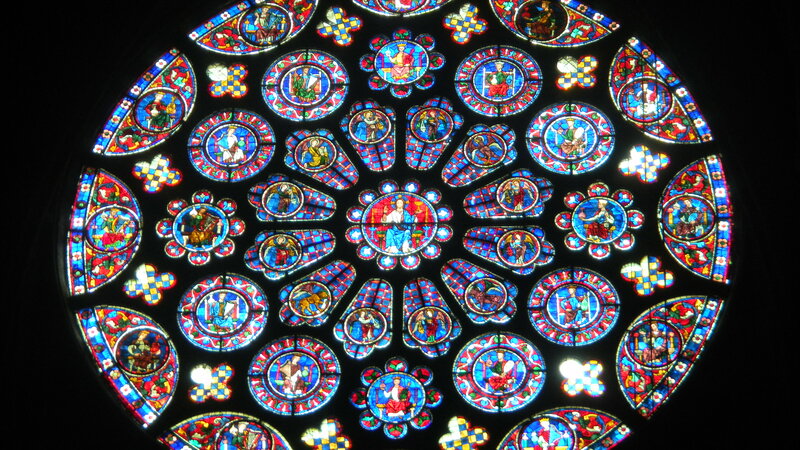 It didn’t spread nearly as much as Chartres’ style did, but it’s as magnificent. 7. Canterbury, England. Its choir was built first, by a French architect. But its nave is very English, full of fine lines in the stonework. The French went for soaring towers and vaults. The English loved linear work. As Gothic style spread beyond northern France, different countries varied it according to their tastes. Please aspire to see how one of Western culture’s greatest achievements flowered into new styles in Top Gothic Cathedrals, Churches and Chapels, Part Two. 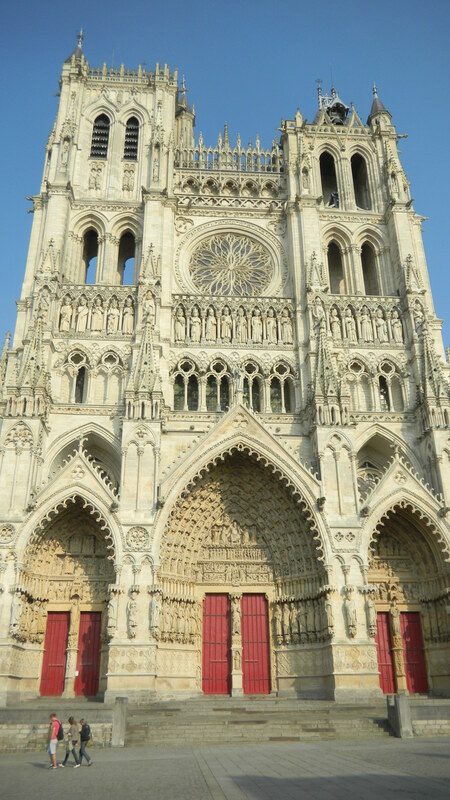 If you can, visit Chartres, Amiens and Rheims in this order, and you’ll see how classic style evolved. 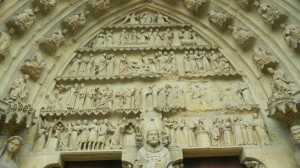 Then, visit Bourges. You can see an equally marvelous religious monument from the same time, at the other end of Eurasia in Ten Facts and Maybes about Angkor Wat. If a European knight had ventured that far, his jaw would have smacked the ground.